One hundred and forty-four aircraft from the U.S. 52d Troop Carrier Wing in the aerial column flew a basic nine-ship V of V's formation stepped down to make it easier to see the silhouette of the lead aircraft against the sky. The air over the Mediterranean Sea was quiet and calm. A quarter moon offered some illumination. Many pilots, who remembered the earlier flight, were confident that this mission would not suffer from the vagaries of the weather. Knowledge that they would be flying a course over friendly territory made them feel secure. They looked forward to a relatively quiet and peaceful night--a milk run. units draw fire from the large number of naval vessels which would be off the beaches. General Browning could offer no such assurances. On 22 June, General Ridgway had presented his views to a joint conference presided over by General Eisenhower. The naval representatives in attendance refused to provide a definite corridor for any airborne mission flown after D-day in the Seventh Army sector. Ridgway had then written to General Keyes, the Seventh Army deputy commander, and recommended that, unless a clear aerial corridor into Sicily could be provided, no subsequent airborne troop movement be made after D-day. Following the prescribed course, the air column rounded the corner at Malta in good shape and headed for Sicily with all formations intact. A few aircraft encountered some light antiaircraft fire from Allied shipping north of Malta, but no damage was done and the column continued serenely on its way. Inside the planes, some paratroopers closed their eyes and dozed; others craned their necks to look down at the sea. Off the Seventh Army beaches, though, all had not been serene on 11 July. Dawn of the 11th had brought with it a heavy aerial attack. At 0635, twelve Italian planes had swept down over the transport area off Gela, forcing the ships to weigh anchor and disperse. Two transports received near misses. One, the Barnett, was badly damaged by a near miss which blew a hole through her side. Enemy air attacks against the beaches and shipping continued throughout the day.6 At 1400, four planes strafed the Gela beaches while a high level enemy bomber dropped five bombs in the anchorage area. In the Scoglitti area, four bombs fell about 700 yards off the port bow of the Ancon at 1430. At 1540, around thirty Junker 88's attacked the Gela area, harmlessly bracketing the cruiser Boise with bombs but striking the Liberty ship Robert Rowan (one of seven arriving in the first follow-up convoy). 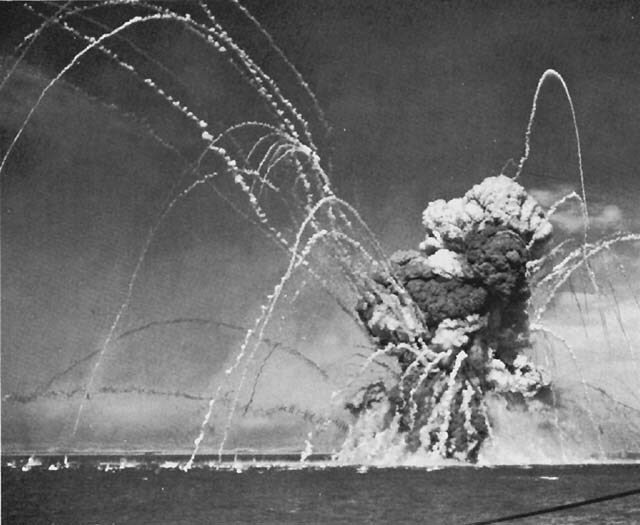 Loaded with ammunition, the Rowan took an enemy bomb in her Number Two hold, caught fire, exploded, and sank in shallow water. Her bow exposed, with smoke pouring from the hulk, she provided a perfect beacon for later waves of enemy bombers. Around 2150 came a massive strike. Near Gela, the Boise and all the destroyers except one were closely straddled. Many ships were damaged by near misses. Bomb fragments hurt another Liberty ship. Again the transports weighed anchor and dispersed. The sky over Gela became a confused jumble of friendly and enemy aircraft flying among the puffs of smoke of ground and naval antiaircraft fire. The melee lasted about an hour. Just before the planes carrying paratroopers of the 504th crossed the coast line, the enemy bombers withdrew. The antiaircraft fire died down. Into this calm flew the 504th. The leading flight flew peacefully to the Gela-Farello landing ground. At 2240, five minutes ahead of the scheduled drop time, the first paratroopers jumped over the drop zone. The second flight was in sight of Biviere Pond, the final check point, when the calm was rudely shattered by a lone machine gun. Within the space of minutes, it seemed as though every Allied antiaircraft gun in the beachhead and offshore was blasting planes out of the sky. The slow-flying, majestic columns of aircraft were like sitting ducks. As one company commander (Capt. Willard E. Harrison) remembered later: ". . . guns along the coast as far as we could see . . . opened fire and the naval craft lying offshore . . . began firing. "7 Only the few planeloads of paratroopers who had jumped several minutes ahead of schedule floated safely to the correct drop zone. THE ROBERT ROWAN exploding off the coast at Gela, 11 July. watched in helpless fury as the antiaircraft fire from both ground and naval batteries cut the troop carrier formations to pieces. At the Gela-Farello landing ground, waiting to receive the paratroopers, General Ridgway was thunderstruck at the events around and above him. At his command post just north of Gela, Colonel Bowen, the 26th Infantry commander, felt stunned by the terrific volume of naval fire. AIRBORNE REINFORCEMENTS in a C-47 heading for Sicily on 11 July. Of the six aircraft shot down before the paratroopers had a chance to jump, one carried 5 officers and 15 enlisted men from the 504th's Headquarters and Headquarters Company; another carried 3 officers and 15 men from the 2d Battalion's Headquarters and Headquarters Company; and the remaining four carried 1 officer and 32 men from Battery C, 376th Parachute Field Artillery Battalion. Of these 9 officers and 62 men, a few miraculously survived. Lt. Col. L. G. Freeman the 504th's executive officer, 2 other officers, and 12 men (11 of them wounded), crawled from the wreckage of their downed plane. 1st Lt. M. C. Shelly, from the 2d Battalion's Headquarters Company, standing at the door of the aircraft when it crashed, was thrown clear. All the other occupants were killed. One of the Battery C planes was shot down at sea, carrying with it all the occupants. From the other three aircraft, 5 men saved themselves by using their reserve chutes--2 managed to get out of one plane after it had been hit twice and was afire, 3 men were blown clear when antiaircraft fire demolished their planes. A total of twelve officers and ninety-two men were aboard the eight planes which returned to North Africa without dropping: two planes with personnel from the 504th's Headquarters Company; one plane, Company F, 504th; two planes, Battery C and two planes Battery D, 376th Parachute Field Artillery Battallion; and one plane, Headquarters Battery, Division Artillery. 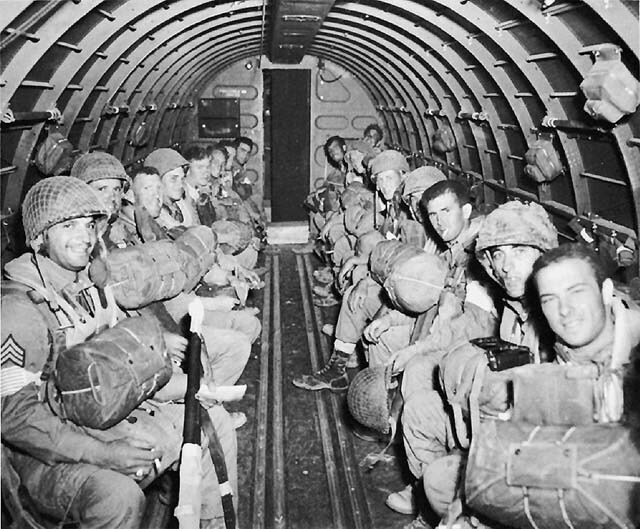 Four dead and six wounded paratroopers were taken from the planes that returned. General Eisenhower quickly demanded a full report of the disaster. On 13 July, Brig. Gen. Paul L. Williams, commanding the Troop Carrier Command, submitted his report to Lt. Gen. Carl Spaatz, the NAAF commander. Williams stated that the heavy ground and naval antiaircraft fire directed against the troop-carrying aircraft showed a definite lack of co-ordination between air, naval, and ground forces, or a definite breakdown in the communication systems used to disseminate the instructions of higher headquarters to lower echelons. General Williams would not say which opened fire first--the Navy or the Army--but stated simply that his troop carriers were fired on by both ground and naval antiaircraft batteries. 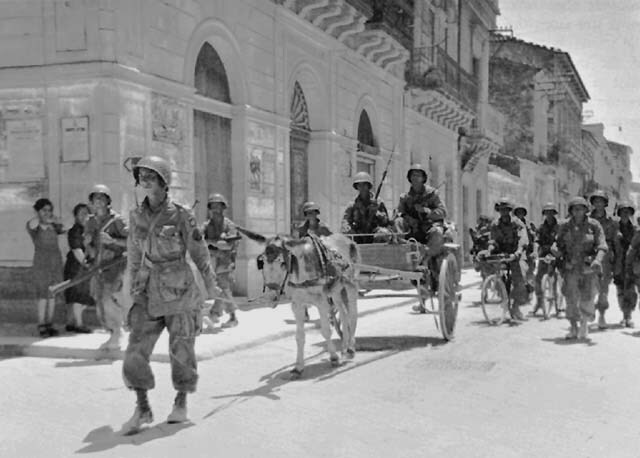 SCATTERED PARATROOP REINFORCEMENTS moving through Vittoria the morning of 13 July. The responsibility for loss of life and material resulting from this operation is so divided, so difficult to fix with impartial justice, and so questionable of ultimate value to the service because of the acrimonious debates which would follow efforts to hold responsible persons or services to account, that disciplinary action is of doubtful wisdom. Deplorable as is the loss of life which occurred, I believe that the lessons now learned could have been driven home in no other way, and that these lessons provide a sound basis for the belief that recurrences can be avoided. 1. General Ridgway dispatched the order at 0839, 11 July. The order was received in North Africa at 1100, and acknowledged fifteen minutes later. See 82d AB Div G-3 Jnl, entry 42, 11 Jul 43: "Mackall tonight wear White Pajamas." See also, Warren, USAF Hist Study 74, p. 39. 2. The NAAFTCC Report (page 85) states that 2,008 troops were carried on the mission; Brig. Gen. Paul L. Williams (commander of TCC) states in his report that 2,304 troops participated. There is no airborne report available that gives the number of men carried, but, according to the strengths of the units at the time, it appears that the TCC report is more nearly accurate. Undoubtedly, General Williams based his figure on an average load of sixteen men per aircraft; the TCC report indicates an average load of slightly less than fourteen men per aircraft. 3. Warren, USAF Hist Study 74, p. 37; Ltr prepared by Ridgway, 2 Aug 43, sub: Reported Loss of Transport Planes and Personnel Due to Friendly Fire, in Ridgway Personal File, 1942-1943, item 42; Admiral of the Fleet Sir Andrew B. Cunningham, Despatch, The Invasion of Sicily, a Supplement to the London Gazette, April 25, 1950, p. 2081; Notes on the Routing of Troop Carrier Aircraft, 24 Jul 43, 99-66.2, sub: AFHQ Rpt of Allied Force Airborne Board in Connection With the Invasion of Sicily. 4. Annex A, Ridgway Ltr, 2 Aug 43; Warren, USAF Hist Study 74, p. 37; 82d AB Div in Sicily and Italy, p. 19n; 82d AB Div G-3 Jnl, entries 43 and 44B, 11Jul 43; Bradley, A Soldier's Story, pp. 132-33; Seventh Army G-3 Opns File, sub: Air Support. This last contains copies of the various messages dealing with the warnings issued to various commands. 5. Ridgway Ltr, 2 Aug 43. 6. The Axis air forces committed 198 Italian and 283 German planes against the various Allied beachheads on 11 July. By far the largest number of enemy air missions was flown against the Seventh Army beaches. OKH, Tagesmeldungen West; IT 99a, an. 2. 7. 82d AB Div in Sicily and Italy, p. 7. 8. A few of the pilots reported they were under fire for as much as thirty miles after leaving Sicily. 9. CO Transport Div 5 Action Rpt, p. 6. 10. Interv, Garland with Brig Gen Reuben H. Tucker III, Washington, 24 Sep 59; Interv, Garland with Maj Gen John W. Bowen, Washington, 4 Nov 59; Bradley, A Soldier's Story, p. 133; Ridgway, Soldier, p. 71. 11. Statement of Flight Officer J. G. Paccassi (F/O, AC, T-185665) on board USS Beatty. The statement is attached to Report of Action of the Beatty, dated 15 July 1943, DD640/A16, ser. 001, part of NTF 85's report of action. 12. Rpt, USS Cowie, 15 Jul 43, DD632/A16-3, ser. 09. 13. Rpt, USS Jeffers, 15 Jul 43, DD621/A16, ser. 025. Morison (in Sicily-Salerno-Anzio page 121, note 51) points out that this ship did not fire on the troop-carrying aircraft because its gun crews had been intensively trained in plane recognition. If so, this was one of the few ships that did not fire. 14. Capt. Adam A. Komosa, Airborne Operation, 504th Parachute Regimental Combat Team, Sicily, 9 July-19 August 1943: Personal Experiences of a Regimental Headquarters Company Commander (Fort Benning, Ga., 1947), p. 13. 15. Komosa, Airborne Operation, 504th Parachute RCT, p. 16. Also see the Ridgway letter of 2 August which brings out the firing on paratroopers by American troops. Both the 171st and 158th Field Artillery Battalions (45th Division) reported skirmishes with paratroopers during the night of 11 July. The 171st Field Artillery Battalion's report states that "since no news of the American Paratroopers had reached this Hq, they were assumed to be hostile and the Bn was deployed for all around defense." During the period of confusion which existed after the drop of the 504th, one artilleryman was killed by his own men when "mistaken for an enemy paratrooper." 16. General Tucker stated that the aircraft in which he flew to Sicily did return to North Africa; the crew later reported over 1,000 holes in the craft. 17. Warren, USAF Hist Study 74, p. 40; 82d AB Div in Sicily and Italy, p. 8. 18. Rpt, Ridgway to TAG, 19 May 44, sub: Casualties, Sicilian Campaign, CT 504, Ridgway Personal File, item 32; 82d AB Div in Sicily and Italy, pp. 8, 19. On 24 July, 52d Troop Carrier Wing casualties were reported as 7 dead, 30 wounded, and 53 missing. 19. 82d AB Div G-3 Jnl, entries 51A and 58A, 12 Jul 43; 82d AB Div in Sicily and Italy, p. 13. 20. File 99-66.2, sub: AFHQ Rpt of Allied Force Airborne Board in Connection With the Invasion of Sicily. See also 0100/4/78, sub: Airborne Operations in HUSKY; 0100/21/1072, sub: Airborne Employment, Operation and Movement of Troops, vol. 2, 13-30 Jul 43; and 0100/12A/71, III, sub: Airborne Forces. 21. Admiral of the Fleet Sir Andrew B. Cunningham, Despatch, The Invasion of Sicily, a Supplement to the London Gazette, April 25, 1950, p. 2081; Msg, Cunningham to Eisenhower, 23 Jul 43, sub: Airborne Troops--Enquiry, 99-66.2. Admiral Cunningham carefully left unsaid why the naval fire was not stopped sooner, or why the ships' crews failed to recognize the C-47 aircraft, particularly when they were flying at such a low altitude and were flashing recognition signals (amber belly lights) continuously. 22. Warren, USAF Hist Study 74, p. 41. 23. Ridgway Ltr, 2 Aug 43.